With the hosts holding a 0-4 record and the away side carrying a 3-1 record to this stage of the season, the outcome of this game shouldn’t be too much of a shock. 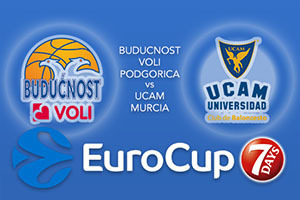 The first game of the season is the only time these sides have met before and the Murcia side won by a score of 86-77. The hosts will be keen to get revenge for that reversal but equally, they’ll be desperate for any sort of win the Eurocup. Four losses in a row will be dispiriting for any team but as we are not at the halfway stage of the Eurocup, this could be a chance for redemption in Group C. If someone is likely to fire up the hosts this season, it will be Boris Savocic, who has provided an average of 14.3 points per game this season. There has also been points on board from Marcus Williams, who has offered up an average of 10.8 points per game while Shawn James has provided an average of 8.3 points per game. These are the players that need to get on the ball and make something happen because if they don’t, the hosts may find that their Group C ambitions are well and truly over for the campaign. With a 3-1 record, the Spanish side will travel in confidence and they have a few players who can make a difference. Facundo Campazzo is the sort of player that wins games and with an average of 16.3 points per game, a big performance from him will have an impact on this match. Billy Baron has provided an average of 13 points per game to UCAM and Vitor Benite has provided an average of 12 points per game. The fact that different players can chip in on a consistent basis is a big indicator of the strength UCAM Murcia has in their squad. It could well be a close run thing but taking UCAM Murcia at -2, which is provided at odds of 1.90 should be a sound bet on Wednesday night in Group C. For the Over/Under market, look to go UNDER 156.5 which is provided at odds of 1.90. Bet Now!